It’s a sloth eat bird ice-cream world…and my network animation debut! I was going for a kinda Fleisher brothers feel with a little Pac-Man thrown in. Take a look at Ariel Martin’s website. She’s definitely got a few things banging around in her head. And, don’t forget to try and catch Oogloo+Anju. Quinn and Mills were surprisingly frank about their different strengths and weaknesses, and their points of disagreement (Mills, we learned, was particularly disappointed by the “dumpy mongrel” dog who plays a big part in Family Ties). Dimples hasn’t seen Dreams and Desires – Family Ties and can’t comment on the acting of the “dumpy mongrel”. 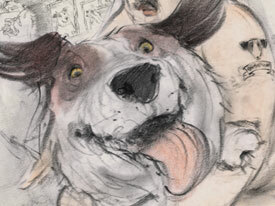 However, judging from the drawing of the dog shown above, we love him. We’re animal lovers at Dimples and one of us has a dog with that precise exhuberant expression of joy. Joanna Quinn has expertly captured “dog soul” in this drawing. 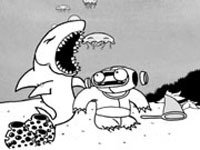 Read our earlier post on Daniel and Tom’s animation win (T.O.M.) atÂ Bristol 2006Â for a comment from Daniel saying that they’re going to be at Sundance along with Joanna Quinn. The list goes on but the few mentions above give you a flavor of the talent pool at Trunk. A huge amount of animation is available on Trunk’s web page including commericials, show reels and movie clips. They’re all worth studying. 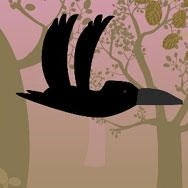 The image above is a portion of a scene from “Leap of Faith” by Steven Smith. Dimples doesn’t even like 3D animation but we liked this. It’s 60 seconds of viewing fun. Steve has a section on the Trunk site about moving images and design that is worth reading/watching. He makes a good point that “words are cheap as chips”. Layla Atkinson is one of those folks who know exactly what they want to do from a very early age. Her most recent film is “Stealth Lunch”. A coordinated band of foxes pursue their prey through a fantastic landscape. This 90 second film is available for viewing on the Trunk web site. It reminded Dimples of a preditor ballet. 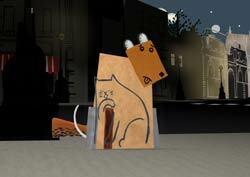 Siri Melchior is the third member of the Trunk team and her movie, “The Dog who is a Cat Inside”, is our favorite. It’s a tremendously inventive bit of animation story-telling. Don’t miss it when you browse the Trunk page. Variety of invention and fantastic story-telling seem to be epidemic at Trunk Studios. Dimples enjoyed the show. 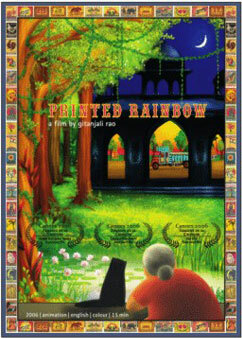 Dimples profiled animation rising star Gitanjali Rao a short time ago regarding her marvelous win at Cannes for her animated short “Printed Rainbow”. Dimples has bemoaned the absence of a website for Gitanjali Rao and/or her movie. Finally, a webpage is available for “Printed Rainbow” here. While there is still no way to view this movie on-line, the new webpage has several stills from the movie. Perhaps, if we keep talking about this film, someone will provide a trailer. Dimples will continue to keep hoping. Times, they are a changin’. Women animators are breaking down doors with imagination and fresh perspectives. Leigh Hodgkinson is one of those women. Have you seen “Cars”? The best thing you can about it is that it wasn’t all bad. A great technical feat? Yes. Enthralling? No. Did you see the special Disney show where the animators and director of “Cars” were interviewed and profiled? Dimples did. Did you see any women? Dimples didn’t but then Dimples was bored and didn’t watch the whole show. Movies are made better when made from multiple perspectives. Cars came from a boy’s perspective and it was ho hum as far as story and character were concerned. Hollywood needs more women animators, writers and directors. Dreamworks, as discussed in the previous post, has just hired the very talented Scottish animator Sharon Colman. Dimples thinks Hollywood needs to make a return trip to the UK and take a look at the work of Leigh Hodgkinson. She tells great stories with great characters. In 1995, after completing an art foundation course, Leigh went to University in Hull, leaving with a first in graphic design. 1999 saw her starting a post-graduate course at the National Film and Television School in Animation Direction where she made two short animated films, “Excess Baggage” and “Novelty”. 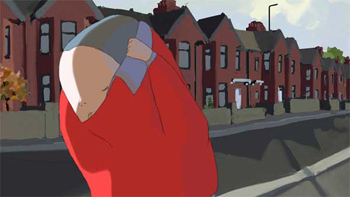 â€œNoveltyâ€ has since toured the world at countless festivals bringing home numerous prizes and awards including the 2002 British Animation Award for Best Creative Use of New Media. Leigh has been a very busy woman in the intervening years. She’s a working animator and director who has proven herself to be extremely accomplished at developing characters and telling stories in many different animation styles. Her film Moo(n) was selected for Sundance in 2004. A great selection of her films is available on her web page and at Slinky Films. 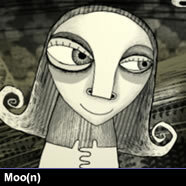 Here is an example of her drawing style from “Moo(n)”. Move over Tim Burton. It’s creepy cool 2D animated delight. Check out these bunny eyes from “Stalk”. There are a few things bouncing around in Leigh Hodgkinson’s head. They’re funny, surprising, creepy and always entertaining.